Follow the Money is a feature recurring every few weeks that takes a closer look at campaign finance using public data. 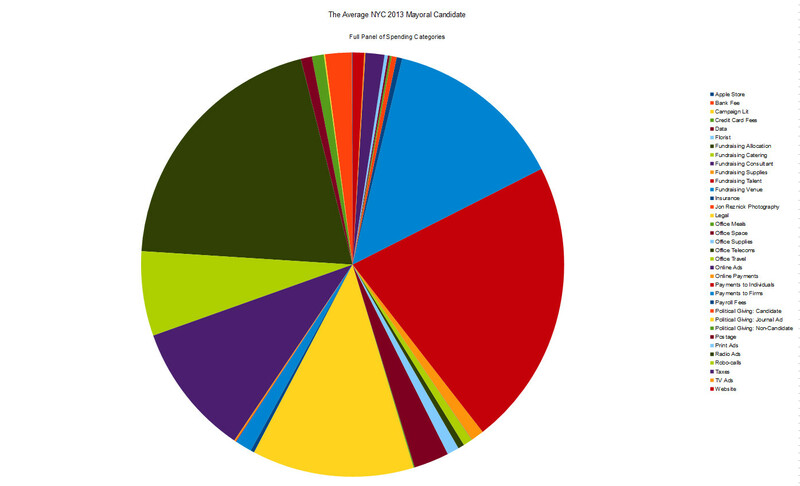 For chart breakdowns and more detailed info on candidates, see Jon’s Tumblr. When a candidate runs for public office in the City of New York, he or she is entitled to receive public matching funds, administered by the New York City Campaign Finance Board. The idea is simple, to encourage “small donors,” any contribution from an individual, up to $175, is matched six times over by the City. Add that $1050 to the original $175 you collect from an individual small donor, and you see that fundraising $175 yields an impressive $1225 in campaign cash. Most of the rhetoric around campaign finance that I hear in and around New York simultaneously holds both that money in politics is inherently bad, but that encouraging small donors – and support that is broader than it is deep – is inherently good. It should be noted that politicians ride an interesting line between selling access and peddling influence. One is considered par for the course while the other is perceived as unethical. The middle distance is blurry, and that’s where the cash travels. 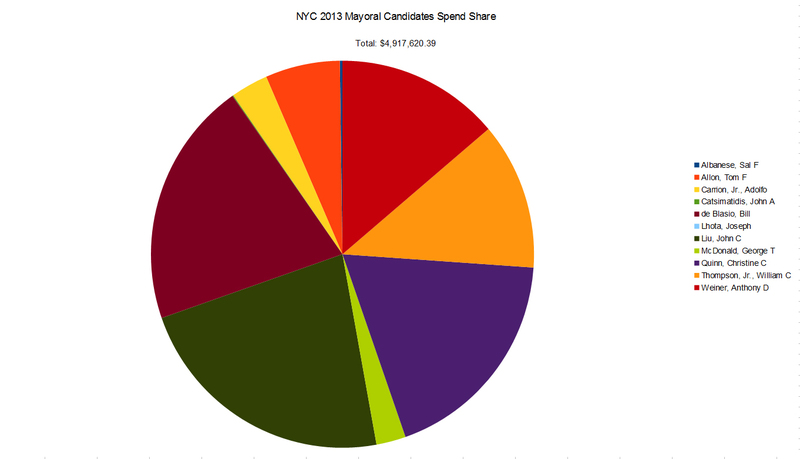 Tens of millions of dollars are raised, matched, and spent by candidates in New York City, and while much hay is made over donor-ship, the truth is that most of the money these folk spend comes from all of us who contribute revenue to the City of New York. Where does this money go? How is it spent? Who are the recipients and beneficiaries of this transfer of public wealth into the private sector? What do we really know about this world? How big is it? How many players are there? Are they connected? — How transparent is our political system, really? The campaign finance data-set is crisp in its simplicity: it is machine-readable tabular data, easily imported into your favorite spread-sheeting app. One may easily de-reference the donor-ship habits of an individual, or check out the benefactors of any particular candidate with ease. Name, City and ZIP, Date, and Amount. Apples to Apples, instantly. Expenditures, on the other hand, are a little more resistant to analysis, because you need to use a woolier set of data, when it comes to knowing how to categorize a particular expenditure. You see, each campaign will file as many as a dozen times with the NYCCFB, and each filing may itself be handled by multiple individuals. Drawn out over time, changes in staff and even campaign personality change some of what’s in the column of data where filers actually classify and explain the expenditure item. This “Purpose/Explanation” field, containing two lines of information, is incredibly messy. You have all these multiple filers each attempting their very best at giving NYCCFB what it wants to know about their spend items. Interpretations vary, as do the personalities of the campaigns themselves. And it is all set down on the permanent record by an individual who is probably incredibly nervous about their regulatory compliance liability. Lawyers often are involved. Campaigns spend money for three reasons: to raise more money, to signal their viability and mentality (often in order to firm up their fundraising pitch), and arguably, last and perhaps least, they spend some money in order to win at campaigning. Organizationally, campaigns tend to be broken into departments of Finance, Communications, Politics, and Field. Lately, campaigns are taking aboard a focus on Data as well, but in that, they are usually leveraging data about voters, not their own operational internals. I have known of no campaign to make a serious analysis of its own financial operations or to compare itself to similar candidacies and its opponents (bear in mind we are talking about NYC elections now). Campaigns tend to be spontaneous, ad hoc organizations that form and conclude their business. They re-form, for successful candidates who seek re-election. Some keep a few lights on in the interim, but the conditions, challenges, opposition, and other factors tend to be perceived from inside any given campaign as fluid and unstable, from cycle to cycle. They may cling to some loyal staffers, or folks who were perceived as part of their past success. They may be looking to strike out in a different direction and try something new. Perhaps the goal lies in a new district, or a bigger race is afoot. Some people acquire new friends and take on new vendors as they rise in the ranks of power. Most of them seek the support of Unions, who are themselves looking for information and tell-tale signs of who they ought to support in this mix. Much of this information may be lifted from the expenditures by campaigns, but in order to analyze them side by side, one must normalize the data, in order to back out all the inconsistencies in Purpose/Explanation information. To this end, I have developed a process that is simple: I execute an objective a set of rules, known to programmers as a “switch statement” while reviewing the expense data. I am assigning each line item to one of around three dozen categories ranging from the Apple Store (because any campaign buying Apple products with public money deserves further scrutiny) to the Website. By the time I’ve run down my set of rules in order, an expenditure has been assigned one of the categories in my taxonomy. First I look at who the vendor is, and then I look at the Purpose/Explanation language, and between these two bits of information, I can quickly and easily drop transactions into this set of categories, which I have found to be mutually exclusive of each other, and collectively exhaustive as well. Once the data are hammered into some meaningful shape, it’s time to take a look at it. 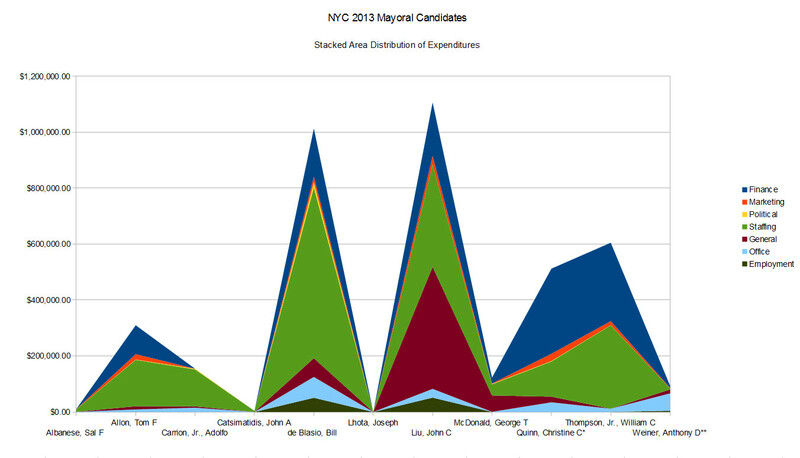 I have already launched a tumblr, which I will be updating and upgrading this spring, but which, like DecideNYC, will be built up over time as a resource tool for campaign data. I will be breaking the ongoing campaign finance story here on the MYD blog, and keeping lots of charts and queries on the Tumblr. Charts like these take shape, and they bring on fresh questions that I do not believe anyone else is asking. We do not interrogate this data in real-time the way we do donorship, and we do not seriously investigate it after races are run and cycles are complete. There is a heavy lift to making meaningful sense of the data, and current electoral victory incentives do not demand any particular speculation into reform of the campaign finance system by the campaigns themselves. As the weeks roll on, I will explain in greater detail some of what I intend to do with all this data, and which other data-sets will be pulled into the project, but ultimately, the name of the game is to quantify and visualize strategic political expenditures. To now, the game has ignored the ultimate outflow of all this money into private hands. That game is changing in New York City. Starting here.